Australia, a continent in the southern hemisphere and also an independent country whose full official name is Commonwealth of Australia. It lies between the Indian Ocean on the northwest, west, and south and the Pacific Ocean on the north and east. The Malay Archipelago and New Guinea are to the north of Australia; New Zealand is about 1,200 miles (1,930 km) to the southeast across the Tasman Sea. Australia is 6,000 miles (9,660 km) from the United States and 11,000 miles (17,700 km) from Great Britain (see Map 1). Because it is wholly within the southern hemisphere, it is sometimes known as "the land down under." Although the Australian continent is one of the world's oldest land areas, it has long been cut off from other continental landmasses, and many unique animals, such as the kangaroo, the koala, and the platypus, are found there. Australia was not discovered by Europeans until the early 17th century, and the origins of the modern Australian nation date only from the first British settlement in 1788. The country is the world's leading exporter of wool and mutton and is a major exporter of beef and wheat. Its resources in important minerals are vast. Australia is also a highly industrialized country. Large deposits of coal and iron have become the basis for an iron and steel industry, while an expanding economy provides a large domestic market for a wide range of goods and services. Australia stretches 1,959 miles (3,153 km) from north to south and 2,489 miles (4,005 km) from east to west, from 10°41´ to 43°39´ south latitude and 113°9´ to 153°39´ east longitude. 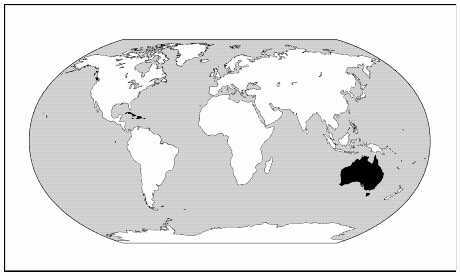 It is the smallest of the continents, with a total area, including the island of Tasmania, of 2,966,155 square miles (7,682,300 sq km), slightly less than that of the contiguous United States. The 22,827-mile (36,700-km) coastline is indented in the north by the Gulf of Carpentaria and in the south by the Great Australian Bight. The mainland is separated from Tasmania, on the southeast, by the 150-mile (240-km)-wide Bass Strait and from New Guinea, on the northeast, by the 90-mile (145-km)-wide Torres Strait. Australia consists of six states -- New South Wales, 309,500 square miles (801,600 sq km) in area; Victoria, 87,877 square miles (227,600 sq km); Queensland, 666,876 square miles (1,727,200 sq km); South Australia, 379,925 square miles (984,000 sq km); Western Australia, 975,101 square miles (2,525,500 sq km); and Tasmania, 26,178 square miles (67,800 sq km) -- and two territories, the Northern Territory, 519,771 square miles (1,346,200 sq km); and the Australian Capital Territory, 927 square miles (2,400 sq km), the latter of which is the seat of the federal government. The Cocos Islands became an integral part of Australia in 1984. Dependencies include Norfolk and Christmas islands, Heard and McDonald islands, and the Coral Sea Islands Territory. Australia owned southeastern New Guinea (the Territory of Papua) and administered northeastern New Guinea and the nearby islands (the UN Trust Territory of New Guinea) until 1975, when the two areas became the independent country Papua New Guinea. Australia's claims in Antarctica total 2,363,000 square miles (6,120,000 sq km). This page was made by Lady Kittara. Most of the links on this page are still in this process of being made. The site is still under serious construction so bear with me please. I am trying my hardest to get this all up as soon as possible for everyone's viewing pleasure. But as usual it takes time and much work. Keep checking back from time to time for expansions and upgrades. Again thank you for your patience and a special thanx to all those who helped me with this page (the language help and all). I love you all. This site was last updated on Tuesday 21st July 1998.